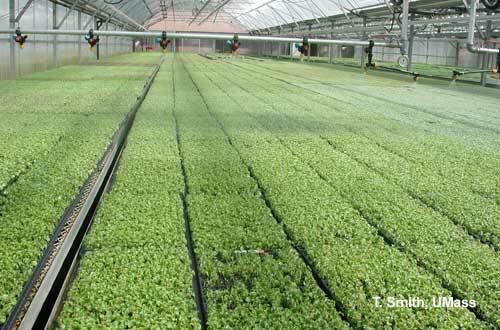 Fertility is an important factor in the production of high quality seedlings by the plug method or traditional row or broadcast methods. Recent research has shown that fertilization must begin shortly after germination and that abnormal seedling growth is often caused by nutrient disorders. 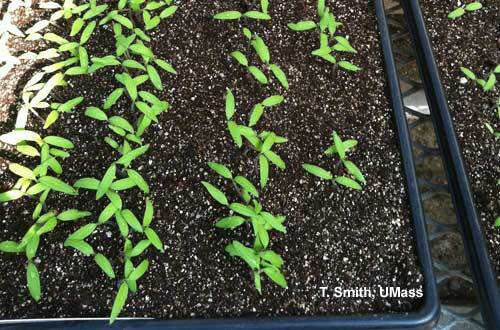 The success of a fertilizer program for bedding plant seedlings and transplants is determined by more than just the rate (ppm) of fertilizer applied. Other factors which are as important as rate include fertilizer type (NPK analysis, micronutrient package, proportion of ammonium (NH4) vs. nitrate (NO3), and pH effect), frequency of application, volume of fertilizer solution applied, and how much leaches from the container. Also the growth rate of the young plant as it is affected by light intensity and temperature influences the fertility requirement of the plants. Table 1. Fertilizing seedlings before transplanting. During Stages 2 and 3 several nutrient disorders may occur, they are: 1) shoot tip distortion or death, 2) misshapen cotyledons or true leaves, or 3) seedling chlorosis. Shoot tip and young leaf abnormalities have been linked to excess soluble salts and deficiencies of either calcium (Ca) or boron (B). Seedling chlorosis may indicate low overall nutrition or a deficiency of iron (Fe). It is important to remember that non­nutritional problems may cause similar symptoms. For example, temperatures below 65°F or chronic, prolonged periods (>4 hr) of water droplets standing on the growing points may cause shoot tip and young leaf abnormalities. In Stages 3 and 4 the fertility program can have significant effects on seedling height and overall size. Levels of overall nutrition, NH4 vs. NO3 nutrition, and phosphorus (P) nutrition have the greatest effects on size. 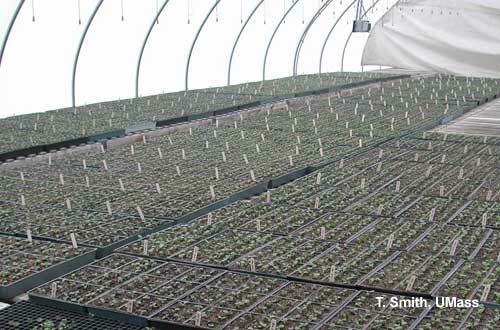 Traditionally, many growers have slowed the growth of bedding plants by not fertilizing or using very low levels. This approach is very effective at reducing height and may improve root growth. However, the disadvantages of low nutrition are that the seedlings become chlorotic and may fall behind schedule. On the other hand high nutrition will prevent chlorosis and keep the plants on schedule, but the seedlings may become too large and the root systems may be small. A moderate level of nutrition (100-150 ppm N) is probably the best compromise. Research has shown that seedlings and young plants of many bedding plant species grow taller and are greener with NH4 compared to N03 nutrition. Taller plants result from using fertilizers supplying >50% NH4 (e.g., 15-15-15, 15-16-17, 20-10-20) and shorter plants can be had by fertilizing with a high NO3 fertilizer (e.g., 15-0-15, calcium and potassium nitrate, EXCEL fertilizers). These effects are somewhat complicated by the pH effects and the P levels of the fertilizers. A mild deficiency of P can reduce height without causing nutrient deficiency symptoms or delay in plant development. The method has been used most successfully with petunias and tomatoes, but most bedding plants are probably responsive. Fertilizers to try are those with a P analysis is 0-2%. Very little P is required to satisfy the requirements of common bedding plants. In fact, the starter charge in many soilless media seems to be enough to carry marigolds and seed geraniums to flowering with little or no effect on height. Growth medium pH is an important factor in seedling production. pH-related problems are common for plugs because of the very small volumes and limited pH buffering capacity of growth medium in plug trays. Many bedding plant species are tolerant of a wide range of pH levels. However, researchers at North Carolina State University have found that a number of bedding plants have very specific requirements (Table 2). These specific pH ranges are needed to prevent micronutrient toxicities or deficiencies of B, Ca, and Fe. Table 2. pH ranges for bedding plant seedlings. Several factors interact to determine pH of a growth medium: materials used to formulate the mix and the amount of limestone added, irrigation water alkalinity, use of acidic or basic fertilizer, and plant species. Most soilless growth media are very acidic to begin with and a portion of the acidity must be neutralized with limestone in order for the starting pH to fall in the range of 5.4 to 6.8. The remaining factors come into play once the mix is in use for growing seedlings and plants. High alkalinity water (i.e., water with pH >7-8 and bicarbonates above 100 mg/liter) causes growth medium pH to go up. The increase in pH can be detrimental to those species in Table 2 needing pH 5.4-5.8. Where alkaline water is a problem, growers can inject dilute acid to lower pH and counteract alkalinity. Keep in mind that alkalinity (level of bicarbonates) is more important than pH. High pH water with low alkalinity is much less a concern than water with both factors high. Some growers use nitrogen fertilizers to manipulate pH. Fertilizers supplying >50% NH4 (e.g., 15-15-15, 15-16-17, 20-10-20) are acidic fertilizers and high NO3 fertilizers (e.g., 15-0-15, calcium and potassium nitrate, cal-mag fertilizers) are basic fertilizers. Continued use of NH4 fertilizers tends to make the pH go down while continued use of NO3 fertilizers makes the pH go up. Generally these changes are not very large (0.5-1 pH unit) and they occur slowly. However, these fertilizers can be very useful in offsetting alkalinity or stabilizing pH in a desired range. Plants themselves can have an influence on growth medium pH. Many growers in Massachusetts have reported sudden drops in pH in soilless media growing geraniums. Oddly the low pH conditions which can develop as the geranium grows are the opposite of what geranium needs! In a North Carolina research project pansy, begonia, celosia, dianthus, and tomato caused the pH to drop while marigold, annual vinca, and zinnia caused the pH to increase. Sometimes these changes are large enough to cause a nutrient deficiency or toxicity. Bedding plants are commonly fertilized on a constant basis at 200-250 ppm N from one of the following fertilizers: 15-15-15, 15-16-17, 20-10-20, or cal-mag 15-5-15. These types of fertilizers are available from several different manufacturers. "triple 15" has lower levels of micro nutrients than the others and cal-mag supplies calcium and magnesium. A common fertilizer strategy is to begin fertilizing vigorous types shortly after transplanting. Small, slow growing types should receive lower rates (100-150 ppm N) or less frequent applications until they are well-established. To increase shelf-life it may be beneficial to cut the rate (ppm) in half at visible bud or about 2-3 weeks before sale. To avoid creating a nutrient deficiency, do a soil test before making a rate reduction.